Five reasons you’ll not want to miss out on this year’s amazing deal! 1. Best Price. Highest Altitude. 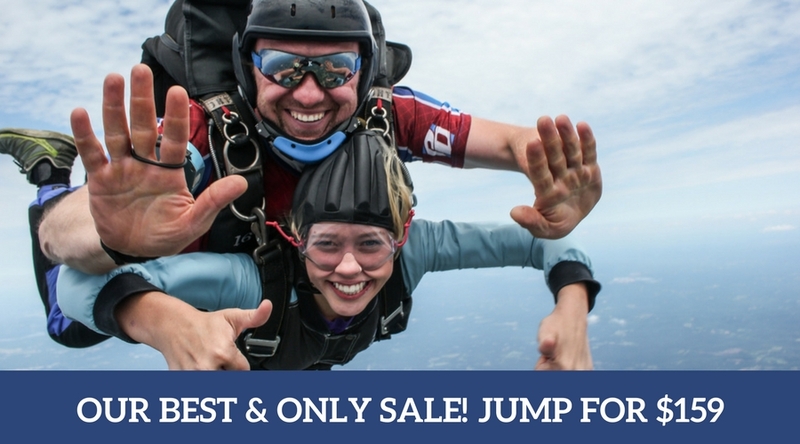 Other skydiving centers may offer a Black Friday deal, but none like ours. Why? Altitude! We’re the only skydiving center in the region (near Charlotte, Columbia, Greenville, Spartanburg, Concord and Huntersville) flying to 13,500 feet in a super roomy aircraft. More altitude means a greater experience! (Learn what makes a great skydiving experience). What’s the first thing you think of when you’re ready to go skydiving? Who’s going to join me? Few of our guests show up to experience the thrill of free fall by themselves. If you have friends, you’ll want to jump together! We’ve got a BIG aircraft to make that happen. Most area skydiving centers utilize four passenger aircraft flying to about 10,000 feet. We’re fortunate to fly a 23 passenger Twin Otter aircraft zipping you and all your friends up to 13,500 feet. Buying a ‘skydiving deal’ doesn’t really sound like a good idea… we’re talking about jumping from a plane! Imagine what your mom will say when you tell her about the awesome skydiving promo you just purchased (she won’t be impressed). You can calm her fears when you tell her you’re jumping with an outfit that’s been around for 31 years and are obsessed with safety and keeping things on the up and up. 4. A Real Skydiving Center. We don’t offer GroupOns or any daily deals. One great deal available for four days. That’s it. Be sure to mark your calendar to not miss it! (click here to learn why we don’t GroupOn).